The Archaeological Market Survey for 2017-18 has been published and is available for download: Archaeological Market Survey 2017-18. This report has been produced by Landward Research Ltd on behalf of FAME, CIfA and Historic England. 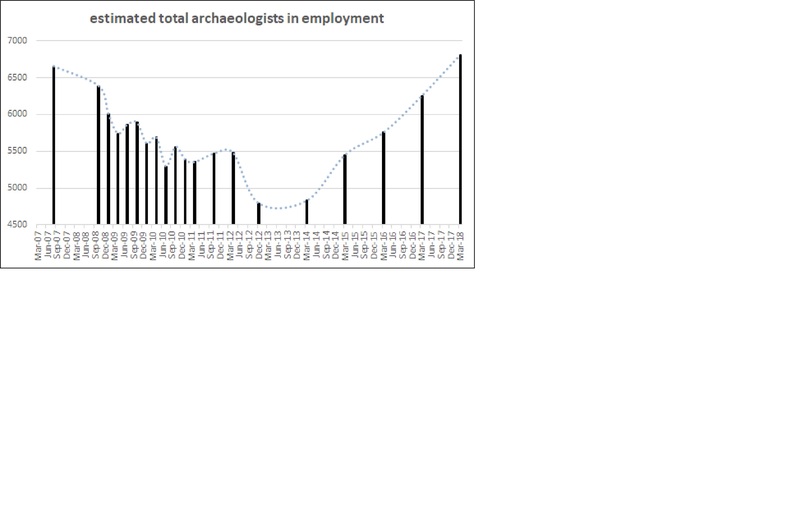 Record levels of commercial investment and employment for archaeologists in the UK. The numbers of people employed as professional archaeologists, both in applied commercial archaeology and across the entire archaeological sector in the UK, were higher 2017-18 than they had ever been before. Despite the sector’s wariness about the future of the market (a major factor in which appears to be the UK’s imminent departure from the European Union), businesses were investing both in staff and business expansion. • In financial year 2017-18 the sector grew in terms of the number of employees , financial turnover and profit levels. • The overwhelming majority of income came from private sector clients (83%, a slight increase from 81% in 2016-17) with residential housing as the biggest sector, but infrastructure projects were also important.